This is a much belated post that wraps up the state and federal responses to MaineHealth, and Vax Maine Kids false vaccine safety claims, made on MPBN in late 2014. By way of reminder, Cassandra Grantham, representing Vax Maine Kids, claimed that there are "several" vaccinated v. unvaccinated studies that show that the product line her company is selling, vaccines, are safe, because fully vaccinated children have no higher autism rates than unvaccinated children. Well after all that, I tried one more time to get Maine to do the right thing. They did not do the right thing. 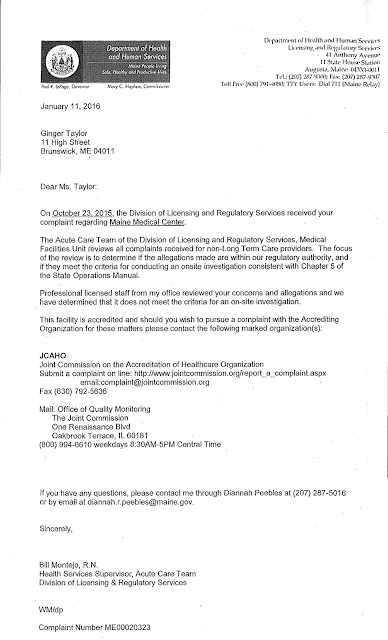 The Maine Department of Health and Human Services, Division of Licensing and Regulatory Services determined that my concerns and allegations, "do not meet the criteria for an on-site investigation." Of course why a false claim on the radio, about research that the federal government has stated does not exist, would require an "on-site investigation," is completely beyond me. My request for an explanation of why this odd ruling was made has gone unanswered. 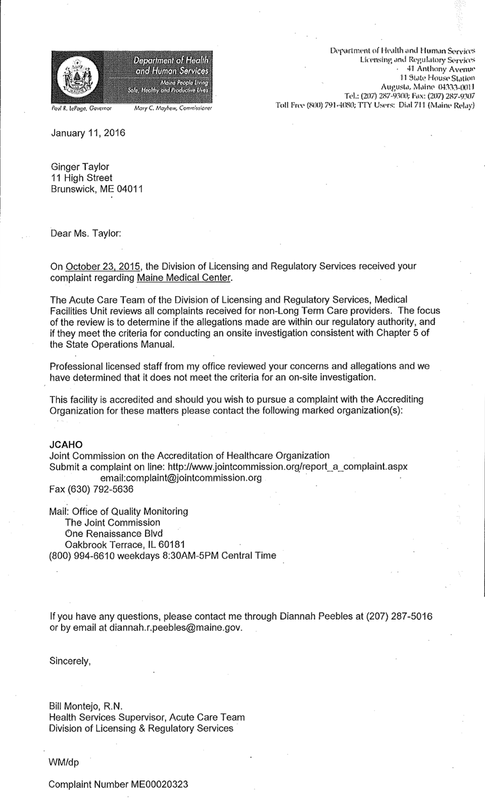 Complaint against MaineHealth for making false product safety claims on pharmaceuticals sold and administered by their corporation. MaineHealth, both on the VaxMaineKids.org web site and during an interview on MPBN on December 1, 2014, have made false vaccine safety claims. I have contacted VaxMaineKids, MaineHealth and MPBN to ask for a retraction and correction of the false marketing messages that they are issuing to the public, but none of the organizations will properly address the issue. During an email exchange last summer with Cassandra Grantham, Program Director of Child Health at MaineHealth, initiated by Ms. Grantham after I had written about her work, I corrected the misinformation, sending VaxMaineKids a list with dozens of studies that link vaccines and autism. (The list now stands at 108 research papers. http://www.scribd.com/doc/220807175/86-Research-Papers-Supporting-the-Vaccine-Autism-Link) Ms. Grantham failed to correct the false claims on the MaineHealth web site, and wrote that she was no longer interested in discussing the matter any further with me. Ms. Grantham, representing Maine Health, made further false claims on December 1, 2014 on MPBN's Maine Calling, when she claimed that there were multiple studies comparing populations of unvaccinated children to children fully vaccinated according to the CDC schedule that have found no increased risk in autism among fully vaccinated children. I will publishing on this soon, and I do have a follow up question. I reported fraudulent safety claims made by an employee of MaineHealth on MPBN, and on their web site. Why was this handled as if I was reporting a safety violation in a facility? Why would a false claim on the radio and in public warrant a facility inspection, and why was this not investigated properly to see if indeed MaineHealth, via VaxMaineKids, is making fraudulent safety claims? I see this ruling as nonsensical. Can you explain this to me? I only generate the letter per what is entered into our system. This was forwarded to my supervisor today. No response from her supervisor was recieved.